I’ve always been a fan of music and have been endlessly fascinated by the mechanics of it. But what really strikes me about it is how much people can be moved- how people’s lives can be changed by hearing the first few seconds of a song like mine was the first time I heard John Mayer’s “No Such Thing”. I set off on a now-10 year journey to explore music, and in that process, learn about myself. I learned how to play the guitar, I began writing songs and music regularly, and even went to school to formally study music. And it has been a wonderful experience so far. But somewhere along that journey, I began to lose sight of the initial childlike wonder of hearing music and letting it affect me. It became more about identifying chord changes, scales, rhyme schemes, and finding out what other songs employed the same structures. I was stripping down songs and music to it’s components habitually for no other reason than because I could. Music had lost some of it’s mystical power and it took years to even recognize it. It was only recently that I realized I was more of the mindset of analyzing music than enjoying it. That’s when I knew something had gone terribly awry. I came across an excerpt from Mark Twain’s “Life on the Mississippi” and it resonated deeply with me. 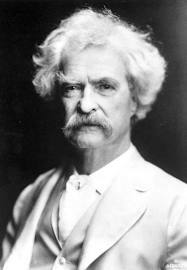 It recounts Samuel Clemens’ experience as a steamboat captain on the Mississippi River and how he became trained in the art of reading the river but had lost the ability to be moved by it. The big question he asks at the end of the piece is have I gained something from my journey or have I lost something even more valuable? I think there is no correct answer and that the two are not mutually exclusive. Personally, it’s as complex as I want it to be, and that is to say very complex. However, I’m happy to say now that I’m consciously trying to find the balance between the two extremes and, thankfully, I am much more happy and content for it. If you related to any of this, I highly recommend reading “Two Ways of Looking at the River“.